The Glacier National Park Silver Bullion Coin honors the national park in the state of Montana. These strikes represent the second in the series for 2011 and also mark the seventh in the program overall. That series is the America the Beautiful Silver Bullion Coin™ Program which first appeared in 2010 and features five bullion coins annually in the likeness of another series of strikes from the US Mint, the America the Beautiful Quarters. Together, both programs honor sites of national interest from around the United States, the District of Columbia and the five US territories. Each bullion coin is composed from five ounces of .999 fine silver. The debut 2010-dated coins had a diameter of three inches, as required by law at the time. That diameter remains the same for the 2011 coins, despite a new new law which permits modifications under the Coin Modernization, Oversight and Continuity Act of 2010. 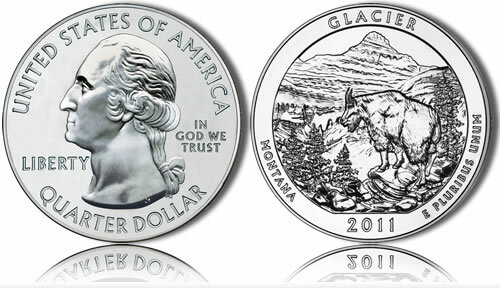 The US Mint released these Glacier Bullion Coins for sale to its network of authorized purchasers on April 25, 2011. The strikes were issued on the same day as the previous strike of the series, the Gettysburg Bullion Coins. Both were initially listed to have a minimum mintage of 126,500. Authorized purchasers took only three weeks to order the Mint’s entire inventory of the strikes which led the Mint to declare them a sell-out on May 16, 2011. At that time, a final mintage of 126,700 was shown. The obverse of each bullion coin features a portrait of George Washington originally designed by John Flanagan. Surrounding the portrait are the inscriptions of UNITED STATES OF AMERICA, LIBERTY, IN GOD WE TRUST and QUARTER DOLLAR. On the reverse of the Glacier Coins, an image of Mount Reynolds is shown which is located in the national park. A mountain goat is depicted at a closer distance. The design was completed by AIP Associate Designer Barbara Fox and sculpted by United States Mint Sculptor-Engraver Charles Vickers. Included as well are the inscriptions of GLACIER, MONTANA, 2011 and E PLURIBUS UNUM. A collectible five ounce uncirculated version of this coin will also be released by the US Mint. The Glacier National Park quarter is the second to be released in 2011 and the seventh overall in the America the Beautiful Quarters® Program. The park is named for its prominent glacier-carved terrain and remnant glaciers descended from the ice age of 10,000 years ago. Glacial forces, ancient seas, geologic faults and uplifting all combined to create some of the most spectacular scenery on earth. Known to the Blackfeet as the "Backbone of the World," Glacier National Park preserves more than 1 million acres of forests, alpine meadows, lakes, rugged peaks and glacially carved valleys in the Northern Rocky Mountains. These lands were first set aside as a national reserve on February 22, 1897 (29 Stat. 907).